After the success of these elders, the flashlight Fenix PD 35 – 960 Lumens is a new edition highly anticipated and very popular too. But what about such a lamp designed for self-defense but that can also be used for all the uses of everyday life? 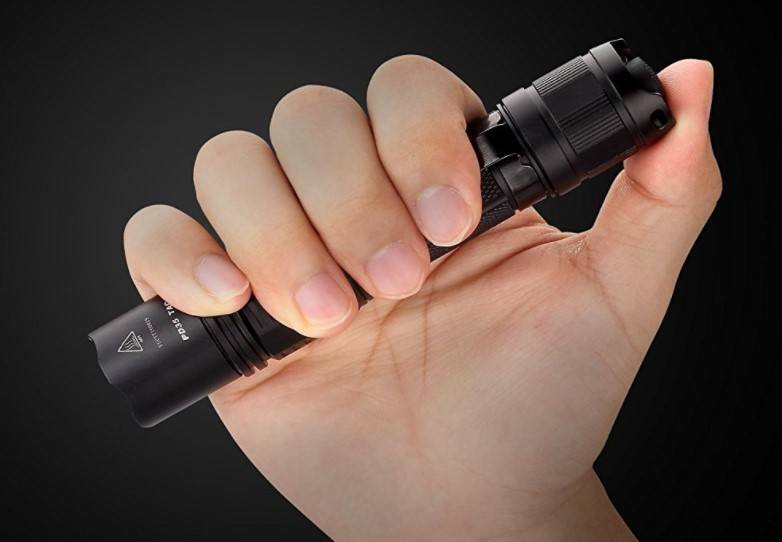 But before switching to the features of this tactical flashlight, be aware that it comes with some accessories: case, strap, belt clip, 1 spare O-ring, 1 rubber switch tip and is guaranteed for two years. 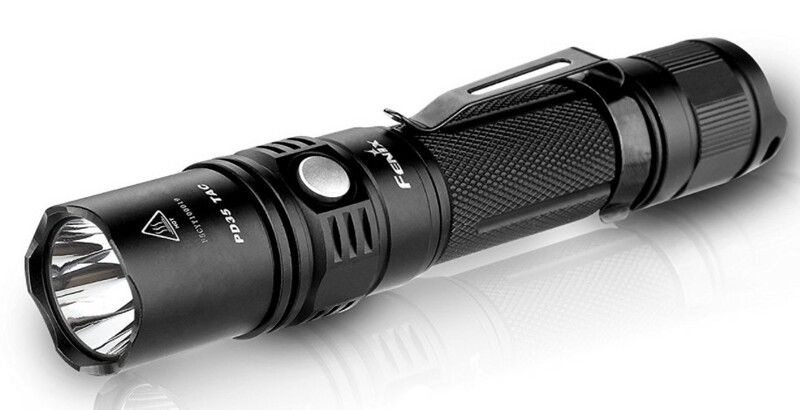 The Fenix PD 35 military flashlight has been tested in its classic version. Or buy the PD 35 at the best price? The Fenix PD 35 offers the advantage of not being very bulky. Indeed, it can slip into your pocket with ease. In addition, it is very light to carry (93 grams with two CR 132A batteries). In terms of power, fans of powerful tactical torches can rejoice because it can generate a luminous flux of 960 lumens with a range of 208 meters. Dimensions: 13.9cm x 2.5cm with a featherweight of 93 grams with battery. Water-resistant to IPX-8 resists immersion up to 2 meters. This lamp is intended for tactical use, understood in extreme situation (in the civilian, army) or for individuals during hiking and nighttime activities gourmands light. So we conducted this test exclusively in an outdoor environment, in the forest more exactly. No surprise, we find the Fenix finish with an anodized aluminum body, very clean as always and very pleasant to the touch. The lamp has been treated to resist water but unusable for water sports like diving! First good point for this tactical lamp is that you can adjust the different lighting mode to achieve the ideal autonomy. Roughly speaking you have 5 lighting modes: from eco to turbo. To make it simple and indicative, in battery saving mode which corresponds to 14 Lumens, the battery will hold around 140 hours . in Turbo mode you will not go past the time. The good news is that the Fenix PD 35 is “smart” in the sense or if you stay in Turbo mode for more than 5 minutes, the torch automatically switch to the lower mode to save battery power. Note that to fully enjoy Turbo and high power modes, it is recommended to invest in a 18650 rechargeable battery pack. A flexible autonomy via tactical modes with all the same more than 100 hours of operation in economy mode. Regarding the power, the lamp provides its 960 Lumens in Turbo mode for a few minutes if you have good 18650 batteries. With the basic batteries, the Turbo mode will quickly tend to run out. In terms of beam projection distance, we reach 200 meters after our forest trail with a diameter of almost 15 meters! For once we were really bluffed by the power delivered by this evolution of the PD32, the Led looks more stable and delivers a homogeneous cold color beam. A big favorite for the brightness produced by this model PD 35, good enough for the majority of extreme sports and outdoor activities. Overall, the lampstands well, an impression of good quality as is always the case at Fenix. Although this tactical model is only 14 cm, you can easily access the tactical button on the front and the power button on the back. We also like the fact that the torch is equipped with a clip to hang it on the pants, very nice, something that does not have Mag-lite. Very good ergonomics and featherweight of 93g, a mix that makes this flashlight a must in the tactical range! Fenix guaranteed its lamps for a period of 2 years (LED included). Ahhhh, what about this little jewel that is the Fenix PD 35? We are simply conquered and it is almost a faultless for this tactical model! It meets all the criteria of a good tactical flashlight with a very good autonomy (with adapted batteries), a breathtaking power as well as all tactical modes suitable for defense and for night activities. In short, we recommend to 10000% this tactical lamp if you want to invest a few dollars in quality! The PD 35 is a long-term investment we guarantee you on an invoice, we have already ordered 2 new to offer our friends!